Before this blog begins to look like a “miniatures only” blog, I had better talk about some other gaming crap. 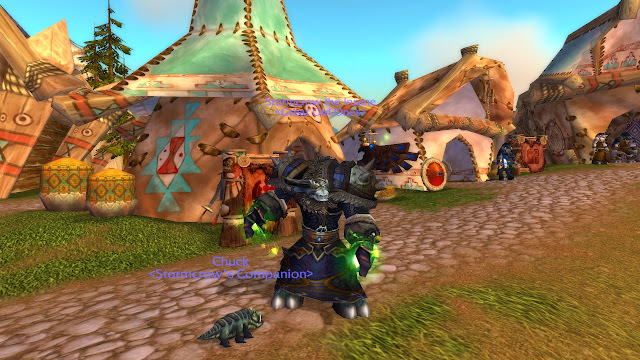 So, let’s talk about World of Warcraft – specifically, the latest re-Transmogrification of my tauren druid, Stormcrow. 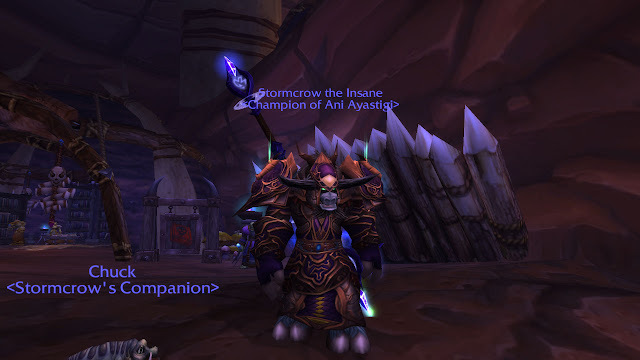 In case you don’t know, transmogrification is a feature of World of Warcraft whereby you can transform the appearance of your current gear to another item (of the same armor/weapon type) that you already own. Since this has zero game effect, it is obviously one of the most important things in the game to me. As I’ve stated before, I love the “Barbie Dress-Up” portions of video games, and transmogrification has added that feature to WoW. It's all about the purples, so why not wear purple? But still, this gear set says “mysterious druid,” whereas Stormcrow, in my head, is more of a gritty, turns-into-a-bear-and-rips-your-face-off feral druid. So I really needed to find a gear set that suited that attitude. The first part was easy – an eyepatch. I went with The Eye of Rend, which I already had in my bank. The next most important thing is shoulders, so I went with Spaulders of the Monstrosity, a great item from Naxx that I also had in my bank. The spaulders are spikey, and (as with all shoulders) nice and huge on a tauren. From there, it was a matter of color-matching. The spaulders are blue, so I needed to match them with similar blues. To accomplish this, the folks at icy-veins.com have a visual guide that will show you every piece of gear wearable by a certain class. This is a huge win. Stormcrow’s new chest and gloves are from the Eviscerator’s Battlegear (which I had to get a Leatherworker to make for me), and Merciless Gladiator’s Dragonhide Legguards (the PvP recolor of Tier 6 druid armor) filled out the leg sot. I didn’t play with the belt because my current belt isn’t a horrible mismatch, and boots don’t show up on tauren with skirts, so all I did to finish was transmog my staff into Origin of Nightmares and I was all done. ...for when you absolutely, positively must look like a pirate in a dress. You’ll also notice that Stormcrow changed from black hide to light gray hide. I had to do this because my raid leader kept confusing the two black cats in the raid. I only want to get blamed for what I do wrong, so I opted into the gray look. The gray bear is pretty awesome. So, that’s our first article on Transmogrification – stay tuned to see more. Or stay tuned and try to ignore senseless articles about the clothes my video game characters wear! Or don’t stay tuned, and miss out on all the fun! To finish the Wolf King (finally), I gave him a different (better?) axe. Here’s Magnus with his new double-edged axe. This axe looks a lot more like Morkai, the axe wielded by Logan Grimnar of the Space Wolves. Since the Wolf King is a stand-in for Grimnar, it makes sense to use this axe. To cover up the gap in between his hip and right leg, I decided to add another animal pelt to the Wolf King, this time as an “apron” like those often worn by Space Marine commanders. Also, to make the corpse of the Chaos Lord on the base blend better, I added some Green Stuff to make it meet the base at a smooth angle. A shot of the Wolf King... probably the last shot before he's primed... probably. Now, when the Green Stuff cures, just a little cleanup and filing and he should be ready for primer! When I get around to painting him, I’ll post more… but for now, say farewell to Magnus Sorensen, the Wolf King! The people demand more Wolf King! (Or maybe they don’t.) Here’re a few more progress updates. First, I added a furry pelt to his right leg. This was really just to give his legs a bit more detail, since most Captains and Chapter Masters have really detailed armor. However, Magnus, the Wolf King, is from a ramshackle Space Marine Chapter whose gear is in poor condition. Rather than a golden god, Magnus is a barbarian lord in the best gear that could be scrounged together for him. Additionally, I added a furry pelt to the inside of his right shoulder. Ok, it's a little weird to be wearing a pelt right there, but if you don't think too hard about it, it looks good. Oopsie. Looks like someone dropped his axe... and his hand. Since it was a joint I’d previously glued together, the clippers just pushed apart the wrist and forearm – a nice, clean cut! Next time on Wolf King… the new axe, filling the last few gaps, and the last few touches before priming!